Now to Him who is able to do IMMEASURABLY MORE...: "A VERY IMPORTANT THING TO DO..."
"A VERY IMPORTANT THING TO DO..."
Abby loves Pooh Bear... and I was prepared! 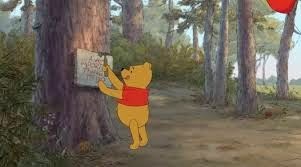 The only problem is that I hadn't seen an episode of Winnie the Pooh in at least 20 years! So, as part of our preparation to meet Abby, Kate and I enjoyed the newest movie, "A Very Important Thing to Do" on the flight over... What a treat! And how appropriate! We had boarded a plane for China and I couldn't agree more! We had "a very important thing to do"! And that "thing" happens to be pretty high on God's priority list, so I'm content that however difficult this journey might be.... I am doing a very important thing that I'm convinced pleases Him and THAT makes me happiest of all! We arrived late on Saturday night and to say we were exhausted would have been the understatement of the century! We were to have our own personal "Meetcha Day" with Abby and her foster mother Melinda the very next morning at 10AM, and I felt a little overwhelmed before we even started. But overwhelmed or not... Abby arrived at our hotel room door just a few minutes behind schedule and it's been a bit of a blur ever since! So without further adue.... Here's the photos you have waited for! Abby is on her way up the elevator! So wonderful to finally "meetcha" Abby! So many new things to discover! Do you think she likes her gifts? Facetime with Daddy, Ellie, Rachel, and Summer Dog (of course!) was "a very important thing to do" too! Melinda's sacrifice for the little girl that now calls me Mommy will never be forgotten! When you see Abby and all her cuteness, will you remember to pray for this precious woman of God? Needless to say, there was nothing typical about Abby's Gotcha Day the following morning. But I'll leave you with one photo, just 'cause! Abby has been a champ during this transition... I can't even imagine what's goin' on in that little mind of hers, but she seems to be taking it all in stride. Today, while spending time with her foster mother for several hours, she did give her the cold shoulder, and I can honestly say that, other than her obvious attempts at being in charge, you'd think she'd known me since she was a bitty thing! 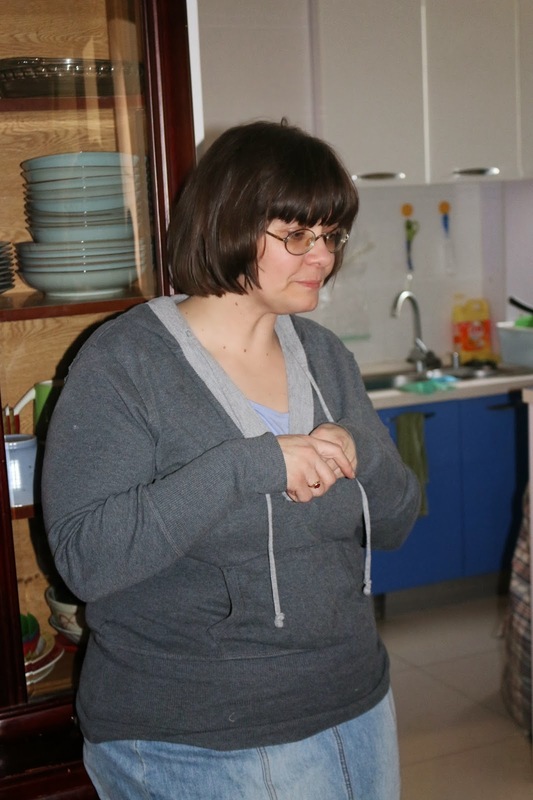 Today included a meeting of Chinese Christian women - all fostering profoundly disabled orphans in their homes. This is difficult at best, in a culture that believes that not only are orphans a curse, but if also attached is a scary diagnosis, they are convinced evil is not far behind. I felt this to a degree when we were adopting Ellie with a hand difference- but nothing like the stares I get with Abby by my side. It's downright disgusting sometimes, and makes me want to hide her under my wing... What a treasure such people miss when they refuse to see below the surface! After a somewhat difficult breakfast experience this morning with more than a stare or two, I was feeling weary and close to tears... I decided to cut breakfast short and head back to the room. That meant that Abby had to climb several steps and then back down several others, before finally plopping down into the stroller I had waiting. While the entire restaurant came to what felt like a screaching holt to watch this whole affair, I kept my eyes firmly planted on Abby and encouraging her along the way to the exit. Once she finally reached the stroller, I lifted my gaze to an older woman completely engrossed in what I was doing. I expected a glare, but instead she smiled sweetly and gave me a thumbs up. That was just what I needed at that moment and it sent me away in a flood of grateful tears. People struggle to know what to say as we adoptive moms weave our way through difficult, unchartered waters... when a simple "you can do this", or "you're doing a great job today" would mean more than they can possibly imagine! But today's visit with fellow believers a world away from my own brought this new call on my life into perspective. I sat feeling as if surrounded by heroes. I was humbled by their selfless choices on behalf of the least of the least... I was even more humbled that God had entrusted one of those very children to me too and I was now counted as one of those very women, though I would be living it out in a world so very far away. 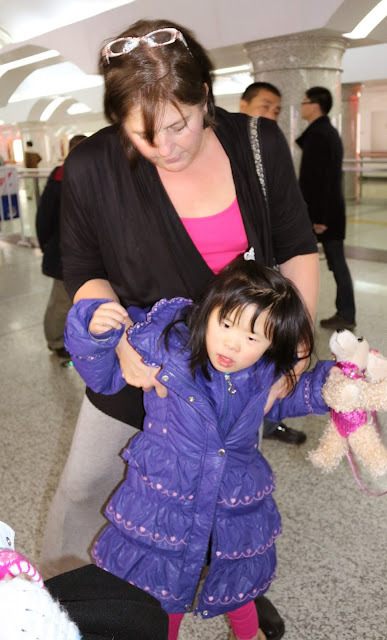 If they could do it in a land with so few resources, surrounded by communities that despised their choices, surely I could do it among friends who already deeply love Abby and all of her special qualities, including that extra special chromosome! I felt a renewed sense of hope and a sudden sense of God's pleasure over the season that began in my life just a few days ago! Excuse me now, though, as I pack up my things for the next step of our journey HOME, because, well... I have "a very important thing to do" you know! Beautiful!! Congratulations, you are truly blessed. Well well well I don't like to cry but I think I had a tear. How special this adventure hadsbeen, thanks for sharing. And I am a huge Winner the Pooh fan too. I am sure there is a new adventure beginning now in her new home. So go buy her some new boots because as Winnie the Pooh said, "When you see someone putting on Big Boots, you can be pretty sure that an adventure is going to happen. " Amen and a HUGE thumbs up!! Many prayers for you all!! Loving you from afar dear friend of mine!! Oh Lori you don't me but I am a friend of Melinda's who remembers when Abigail came to live with her. I am pleased without measure that Abigail is getting such a wonderful family. Know that many prayers have been lifted up for you while you are in China and many prayers will continue to be lifted up as you come home. Great post, Lori! Loved the pictures and I am so thrilled your daughter is finally in your arms! Crying here! Thanks for sharing.